Organizational Behavior 4 Edition Organizational Behavior helps students understand the impact of effective management of people, teams and groups on organizational performance. Through this strategic framework, the authors illustrate organizational behavior as critical to implementing strategy, gaining competitive advantages, and ensuring positive organizational results. The Fourth Edition includes the latest research and literature pertaining to pressing topics like global contexts, motivation and leadership. 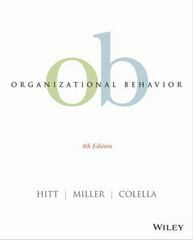 With features that offer managerial advice, highlight strategic initiatives and provide opportunities for self-assessment and analysis, the text encourages students to understand the value of OB to organizational success and to their future careers.Access to WileyPLUS Learning Space sold separately.